In this tutorial we will look at how to use a picture-in-picture (PIP) effect to display a map in the top corner of the screen. The map allows a player to see where they are located in the game world and where nearby landmarks, objects or other players are. 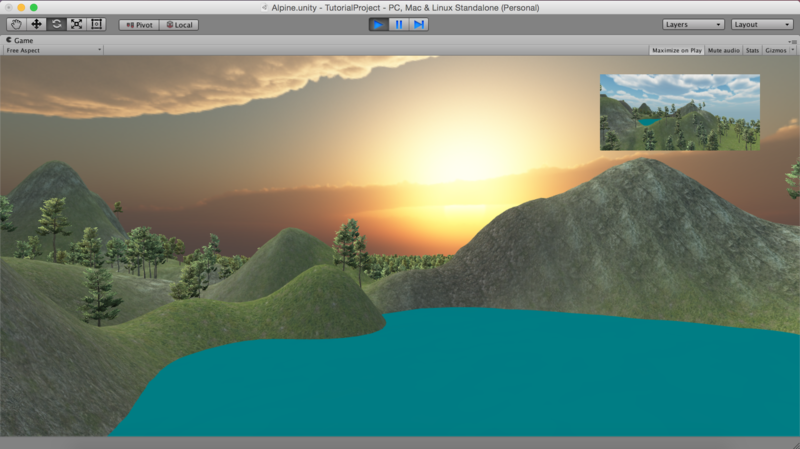 The image below shows a game with a first person view as the main camera, and a PIP effect showing the player’s location on the game map in the top right corner of the screen. 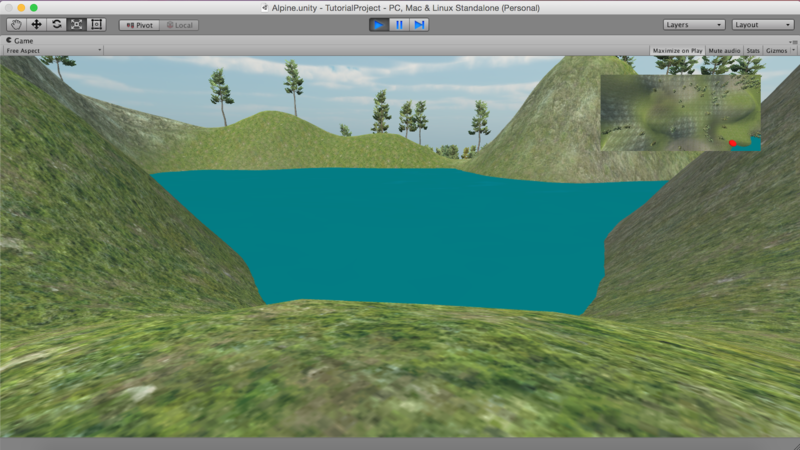 A picture-in-picture (PIP) map in a first-person view game. 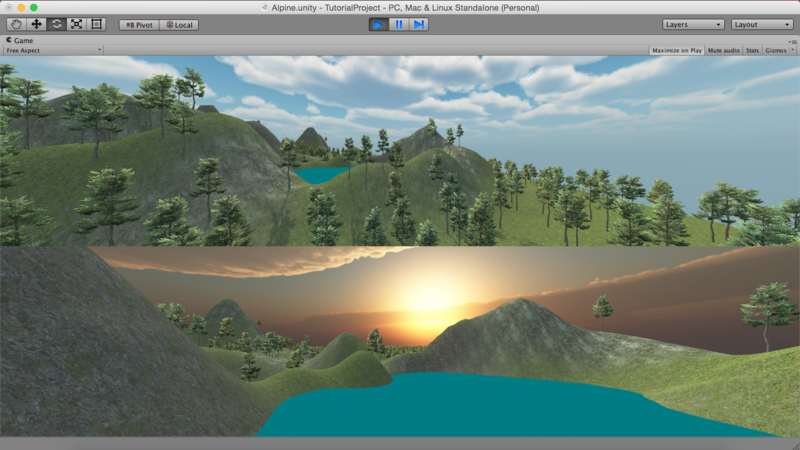 Watch the video below to see how you can add a PIP map effect to your game in Unity. In this scene you can’t actually see the red sphere in the first person view because the character is inside the sphere. However, if you were using a third person view, you would probably see the sphere. In this case, you would want to hide the sphere on the first person camera and only show it on the map camera. This is possible to achieve with the use of layers which is what we will look at in the next tutorial. Tip: You might want to have the object that represents a blip on the map to be higher so that it is still visible if a character goes inside a building or cave or under another object. See if you can work out how to have the map camera follow the player around so that their blip doesn’t disappear off the map. This is something you will need to know if you have large scenes where the camera does not cover the entire scene. We will also look at how to handle errors that you might see related to multiple audio listeners. To find out how to add cameras to objects, add split screen camera systems and PIP effects, watch the video below. This video tutorial explains how to create a ripple effect in your animation using Adobe Flash. In the example below, the ripple effect has been applied to a circle. This can be achieved in just a few minutes using Adobe Flash. Watch the video below (or here on YouTube) to find out how. Watch the video below to learn how to apply the zoom and fade effect to your animation. You can also view the video on YouTube by clicking here. This video tutorial explains how to use a motion tween tint colour effect to fade objects in Adobe Flash CS6. Click here to watch the video on YouTube or view it below. This video tutorial explains how to spin or rotate objects by changing the rotation effects on a motion tween. You can spin stationary or moving objects. The video is also available on YouTube here if you’d prefer to watch it there. In this video tutorial, I explain how to create a 3D clipping mask effect by using an image to fill in the letters of a text object in Adobe Photoshop CC 2014. The steps are identical in Photoshop CS6. View the video below or click here to watch it on YouTube. This video tutorial shows how to reveal text using a spotlight effect by using the mask tool in Adobe Flash CS6. You can view the video below or click here to view it on YouTube. This video tutorial explains how to morph text using a shape tween effect in Adobe Flash CS6. You can view the video below or click here to view it on YouTube. This video tutorial explains how to morph shapes using the shape tween effect in Adobe Flash CS6. You can view the video below or on YouTube by clicking here.